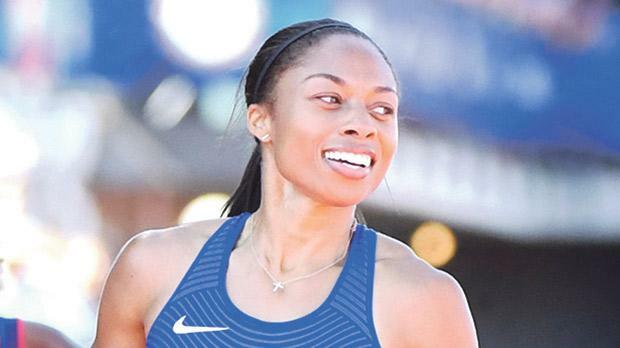 Allyson Felix and Justin Gatlin powered to the fastest times in the world this year to book their tickets for the Rio Olympics at a high standard US trials, in Oregon, on Sunday. World champion Felix shook off an ailing ankle to win the women’s 400m in 49.68 seconds before Gatlin claimed the 100m over fellow world medallist Trayvon Bromell in 9.80 seconds. The 20-year-old Bromell was second in 9.84. Felix, still running in pain from the April injury, accelerated from fifth place off the bend to take the lead on the home straight and keep alive her dream of becoming only the third woman to complete a 200-400 double at the same Olympics. She starts the 200 metres trials on Friday. “Two months ago I couldn’t even walk,” the Olympic 200m champion told reporters after securing her spot at a fourth Olympic Games. Gatlin had shown in the semi-finals he was ready to make a statement by clocking 9.83 but the 34-year-old was pushed all the way by a fast-starting Bromell in the final before the 2004 Olympic gold medallist finished the stronger. “This year I have had little knocks and bruises, ankles, quads, hamstrings, but at the end of the day when the competition shows and rises, I have got to rise with it,” Gatlin said. Marvin Bracy (9.98) grabbed the third spot as veterans Mike Rodgers and Tyson Gay took fourth and fifth to miss out on the 100 metres team for the August 5-21 Games. English Gardner claimed the women’s title in 10.74 with Tianna Bartoletta and Tori Bowie both clocking 10.78 to also advance. LaShawn Merritt powered away from the field in the final 50 metres to win the men’s 400 in the year’s best time of 43.97. The decathlon title went to Oregon native Ashton Eaton, whose winning total of 8,750 points is superior to the personal bests of any of his rivals destined for Rio, according to statisticians. Chaunte Lowe, the 32-year-old mother of three, made her fourth Olympic team in the high jump, outperforming rising world indoor champion Vashti Cunningham. Lowe cleared 2.01 metres, the first two-metre jump of the year, with the 18-year-old daughter of retired National Football League quarter-back Randall Cunningham leaping 1.97 to also qualify the Games. Jeff Henderson outdueled collegiate champion Jarrion Lawson for the long jump title, leaping a wind-assisted 8.59 metres to beat Lawson by one centimetre with the runner-up registering the best legal mark of the season. Olympic bronze medallist Will Claye finished third but will not be going to Rio because he does not have a legal qualifying mark, leaving fourth-placed finisher Marquis Dendy to claim his spot.